Bún, popularly translated as ‘rice noodles’, is a staple of Vietnamese cuisine and one of the most popular noodles, used for preparing a plethora of delicious and exotic dishes, some good and some, well, exotic. Bún chả (bún with grilled pork), bún thịt nướng (bún with grilled meat), bún đậu mắm tôm (bún with tofu and shrimp sauce), bún thang (bun with chicken, sliced fried egg and pork) and bún ốc (bún with snail) can all be consumed at dusty meal vendors around the city but which one is the best? To answer this question it is imperative to investigate with your nose, mouth and mind. First of all, you can’t just choose any bún chả or bún thịt nướng place willy-nilly. You must do some research, either with your own palate, which can be fun, time-consuming and occasionally disappointing or you can ask a local to tell you what street or area makes the best particular bún dish you are coveting. More often than not the answer is bún chả, especially if you are asking an Ex-Pat, tourist or western student in Hanoi. Why? Simply because it is preposterously delicious and ultimately and because it agrees with even the most picky of Westerner palates. Bún chả is a paragon of noodle deconstruction; it is served on two separate plates and one bowl, all celebrating powerfully simple flavors, and is consumed by combining the three in accordance with your preferred taste. The first plate consists of the obligatory Vietnamese mound of herbs, the second plate is piled with pristine white bún noodles and the bowl is full of a steamy sweet broth, sliced carrots and susu, and grilled pork. While the herbs and bún play integral parts in this dish, it is the grilled pork that makes this dish a dynasty. The pork is seasoned with a secret family recipe then placed into a flat metal cage, which is turned over a charcoal fire until the pork is cooked. The grills used to cook the chả are sustained by small fans that simultaneously function as homing beacons, blowing the delicious smell of grilled cha into the streets and up the nostrils of passing motorists. When you get a good whiff of bun cha, it is hard to keep driving. Once all three pieces of the bun cha puzzle are in front of you, it is high time to consume the traditional Hanoian dish, this is obviously the best part. Everyone eats their bún cha a little differently but the general approach is to place a chopstick full of bun noodles into the broth, gather a piece of meat and some veggies and lift the delectable morsel into your watering mouth, chew, swallow and repeat. To alter the taste of your bites, many people add their own combination of herbs, either by placing them directly in the broth or by eating them prior to any given bite. Yum! For an added bonus, order some nem rán hải sản (fried sea food springrolls) and dip them in the broth, which doubles as nem rán dipping sauce. Phở might be the most famous dish of Vietnam but there is nothing that screams Hanoi louder than bún chả. A trip to Hanoi without at least one sampling of bún chả is like a trip to Paris sans the Eiffel Tour but make sure to seek your bún chả fix in the afternoon because it is strictly a lunch dish (although you can occasionally find it at night). 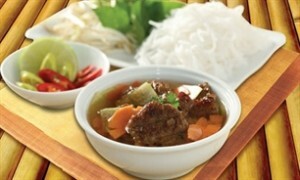 Because it is a traditional Hanoian dish, bún chả can be found all over the city. Many places around the city boast the best bún chả and because the dish is so popular many of these places concoct rather tasty bún chả to back up their claims. However, if you are a true foodie, interested in the best bún chả in Hanoi, head to Le Van Huu, off Hue Street by Cho Hom market, and follow your nose. I promise that you will not be disappointed.